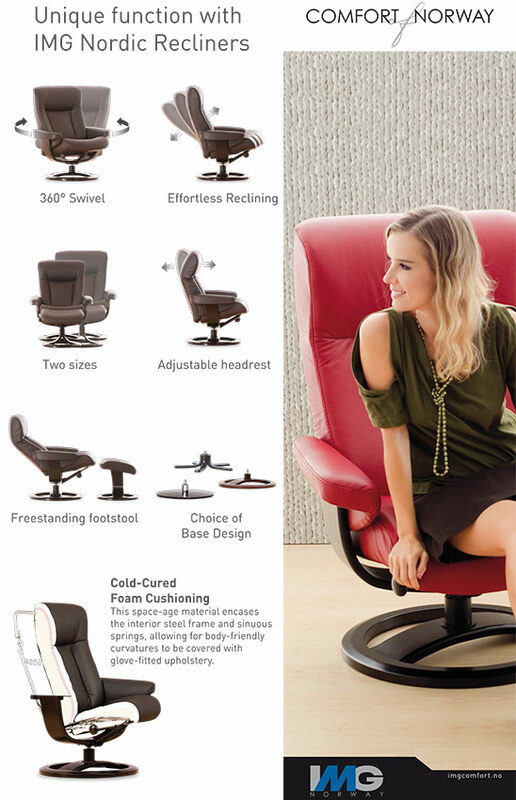 The Loki is a sleek and stylish recliner chair with a practical easy to use smooth mechanism. Each item in the IMG range is manufactured with the utmost diligence towards the finished product. Sitting in an IMG chair or sofa you will discover their passion for excellence, meaning craftsmanship coupled with body correct comfort. Strength, durability, stability, effortless function, beauty and lasting healthy comfort are the guiding star for all IMG products. Available in Leather or Fabric in an array of colours. IMG is owned and managed by the Hjellegjerde family of Norway. Furniture creation and production has been part of the Hjellegjerde family for generations. “I am proud to carry on the furniture tradition started by my Grandfather Otto Hjellegjerde in 1941” says Nils Gunnar Hjellegjerde (President and CEO of IMG). Our passion is to engineer and design furniture that delivers world leading comfort and back-saving ergonomic support. Our vision is to create and exclusively produce designs that deliver an exceptional combination of comfort, quality and unsurpassed value. Within every chair and sofa — you will discover IMG’s passion for excellence. By excellence we mean craftsmanship coupled with body correct comfort. We start by designing our unique seating systems from the inside, out. This philosophy combines the science of body correct ergonomics with old-world craftsmanship and state-of-the-art technology. Our entire range is designed, engineered and tested by our Norwegian product development team. IMG of Norway pursues perfection through attracting experienced people and partners who share our vision and love of furniture. We try to create an atmosphere of inventiveness and optimism – with a relentless drive to improve and create better tomorrows. It never ends. You can never stop innovating and improving. That’s a belief we’ve built our company on. And we’re dedicated to applying that philosophy to everything we do. When we design we start with understanding the needs of the people we design for. The human body is the pattern for every piece of our furniture. We study the human body so we can develop and deliver furniture for daily use that balances creative design with comfort, health, ergonomics and space efficiency. The IMG Design Centre is located in Sykkylven at the northwest coast of Norway and our products are designed from the inside out by our team of Norwegian designers and engineers. Strength, durability, stability, effortless function, beauty and lasting healthy comfort are the guiding star for all our products. Our vision is to create and deliver products that offer an exceptional combination of comfort, quality and unsurpassed value. Our range is engineered to exceed expectations and will perform beautifully for many years to come. All designs and covers are created with this in mind. IMG has implemented a world-class quality management system that ensures all components are routinely tested to make sure they exceed the most stringent European standards. Within every chair and sofa — you will discover our passion for excellence. By excellence we mean craftsmanship coupled with body correct comfort. We start by designing all of our seating from the inside, out. In doing so we artfully combine the science of ergonomics with old-world craftsmanship and state-of-the-art technology. This technology includes our unique mechanisms, cold-cured molded foam, lamination and distinctive designed inner steel frames. All IMG materials are selected to ensure optimum performance. Each material has been individually assessed to provide the correct style and comfort for each model. Our skilled team utilizing specialized equipment in combination of years of experience to secure the best outcome. We show great respect for good craftsmanship and leave our mark on every single piece of furniture – of the person who last handled it. This mark is the fingerprint of a proud producer and is also your guarantee that the furniture from IMG is built to last. Three words describe our manufacturing difference: BUILT TO LAST! There are no shortcuts to producing the very best seating. Designing for ultimate comfort is one thing, but using only the highest quality materials for lasting comfort is another. Each and every product IMG Norway makes is created at our own purpose build vertical integrated production facilities in Thailand and Vietnam. This provides the necessary control to assure the standard of quality that is our hallmark. Specifically, we employ our own team of seating engineers and exhaustively test each design for durability, stability and effortless function, while maintaining the integrity of the basic eye-pleasing aesthetic. Furniture should last for years and stand the test of time. IMG has therefore implemented a world-class quality management system and all our products have been quality and strength tested to at least meet the standards set by BIFMA, GS TUV and Norsk Mobelfakta. You should also know about our commitment to the environment, and the health of our customers as well as our employees. We are aware of the environmental effect of our production processes and product lifecycles and IMG continuously work towards being as environmentally friendly as technologically practically possible. Out of respect for you and the environment, the best thing that we can do is to make furniture that is long lasting. To protect our environment we regularly assess the whole life-cycle of our production with focus on the type of raw material used, production processes, waste, use and disposal. We work diligently towards achieving reduction in the use of substances that could be harmful for the environment and the health of our employees, partners and customers. Creating sustainable products by using eco-friendly raw materials, reducing waste factor and the energy consumption in our production processes as well as extending the useful lifetime of our products and recyclability are other focal points. © 2014-2019 Corrimal Lounges. All Rights Reserved.